June 30, 2016 Robert W.
89109 poster banners for trade shows allows for the printing of banners for the hundreds of trade shows and conventions that are held in Las Vegas every year. These poster banners come in a variety of banners. They could be vinyl banners, mesh banners, retractable banners and many other types of banners. 89109 poster banners can be retractable banners ( also known as roll up banners, vertical banners, upright banners) These retractable banners allow for quick set up graphics at the trade shows and are one of the most popular graphics at these shows. 89109 poster banners allows for the printing of vinyl banners for backdrop graphics at the trade shows. These backdrop banners help a presentation by doing a visual reinforcement of the marketing message you are selling. Banner stand displays are available that can adjust to your banner size and be used as a backdrop and be used multiple times. The banner display stands come with a easy carrying case for mobility. 89109 poster banners also include mesh banners. Mesh banners are vinyl banners printed on a banner material with holes in it that allows for wind to pass through. If the trade show or convention is held outdoors, it is wise to use mesh banners in case the wind comes up unexpectedly. Poster banners are easy to set up and are very popular at these trade shows. They can be made very quickly if necessary and with the state of the art printers that are in Las Vegas, they are bright and colorful in colors. The banners are usually printed on a 13 ounce banner material and come with reinforced edging that holds the grommets that allow for easy installation. 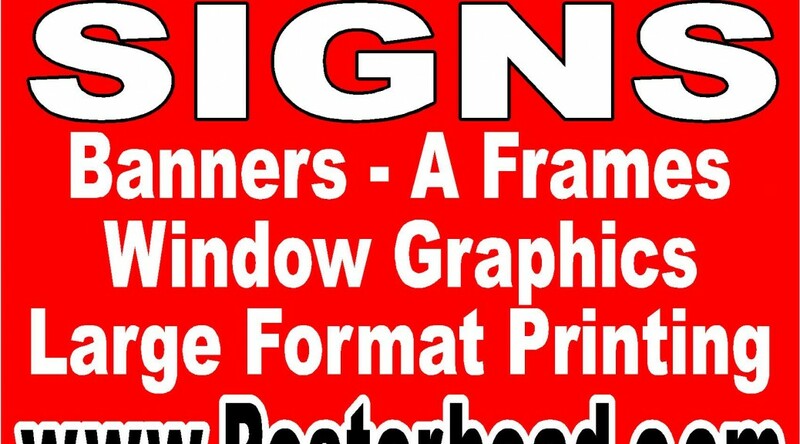 Poster banners can be found at many of the local sign shops and print shops in the Las Vegas area at very reasonable prices. June 28, 2016 Robert W.
Installing a banner yourself is not as difficult as you might think. After the purchase of a vinyl banner at a sign shop or online, why pay a professional to install the banner if you can do it yourself. After all, the professional installer will want as much as the banner ( and sometimes more) to install your newly purchased banner. Vinyl Banner signs are generally made with a 13 ounce vinyl banner material with specially designed inks that allow the banner to be used both indoors and outdoors. The inks will not fade in the harsh sunlight of Las Vegas. ( if the banner is printed with indoor inks-as some disreputable places try to do to lower their ink costs) the vinyl banner colors will quickly fade with the hot summer sun. Latex and eco solvent inks are designed to last a long time in the outdoor elements. Your vinyl banner will come with grommets that allow your banner to be easily hung. The preferred method of installing the vinyl banner is to place it against a solid surface so that no air or wind can get between the banner and the surface. If wind gets between the banner and mounting surface, tension and pull will occur against the banner’s grommets ( which will eventually end up with a damaged banner) This is why banners attached to fences do not last. The wind causes great tension on the banners where it is mounted to the fence by zip ties or other means. The force of the wind causes constant tension on the grommet and it is torn from the banner. Placing a washer with a screw through the grommet is a great way to secure your banner to your mounting object. Also, make sure you leave your banner in the sun for 10 or 15 minutes so that it heats up so that it can be stretched when you hang it. Putting it up cold will allow the banner to sag when it heats up after it is installed. June 27, 2016 Robert W.
People from all over the world come to Las Vegas for the trade shows and exhibits, either to display or to find out what the cutting edge products and technology are available. Consequently, people displaying and plying their profession at the show use graphics to help sell their ideas and products. While there are several different types of graphics used at the exhibits like foam core signs, banners, acrylic signs, banner stands etc, roll up banner stands seem to be one of the most popular graphics in use. 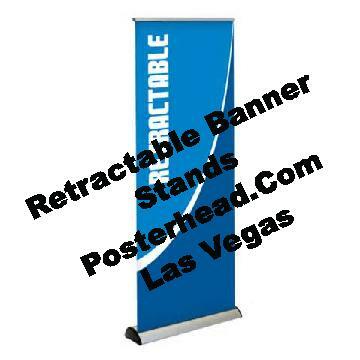 This is probably due to the fact that Las Vegas 89109 roll up banner stands are so easy to set up and take down. It takes only a few minutes to set up one of these stands and about the same time to take down and put away in the convenient carrying case the stand comes in. The banner stands can be used over and over again or simply tossed and a new banner stand made for the next show. Many vendors prefer to have the graphic made in the town of which the show is being held so that there is no chance of the graphic being damaged or lost while traveling to Las Vegas. There are many horror stories of the transport companies losing or damaging the graphics and then being discovered the day before or the day of the show. Then the vendor finds themselves without any visual reinforcements that they were counting on and having to scramble to find replacements at the last minute. Las Vegas 89019 roll up banner stands can be made at any of the local Las Vegas sign facilities. June 26, 2016 Robert W.
Las Vegas Commercial 4ft x 4ft real estate signs are very observable at commercial properties throughout the Las Vegas area. Many real estate professionals use the 4ft x 4ft signs as a way to advertise the property for lease / rent with this type of signage. Las Vegas commercial 4ft x 4ft signs are placed on the property for lease in the landscaping area ( so as to avoid conflict with passing pedestrians) so that they are located near the edge of the property so that the signage can be easily be seen by passing vehicles. The commercial 4ft x 4ft signs are usually held up by 4″ x 4″ posts ( two of them) and displayed at the best angle possible so that they can be easily be seen. Many times, the commercial real estate agents will make a “v” out of the sign ( with three 4″ x 4″ posts) so that it can be viewed at by traffic in both directions. Las Vegas commercial 4ft x 4ft real estate signs are not expensive. 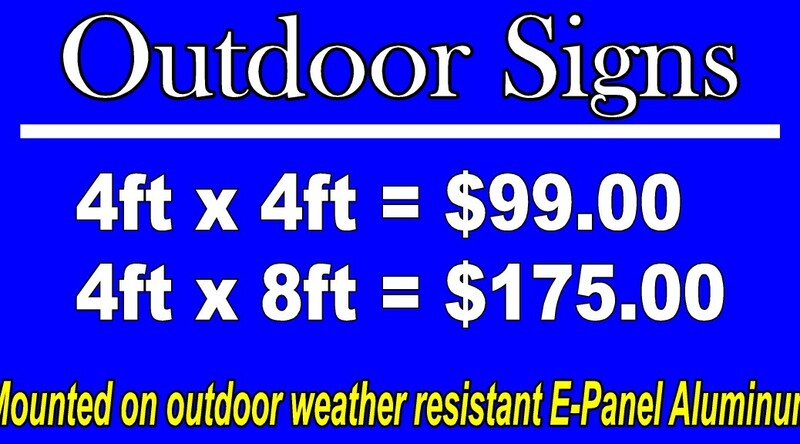 The cost of a 4ft sign ( mounted on double sided aluminum for strength) is less than $100. This double sided aluminum has a filler panel added for strength that makes the sign tougher than those old wooden ones and the aluminum sign does not warp or rot in the Las Vegas weather. The aluminum sign looks much better than the old wooden signs and much more professional. They also last longer because they are not top heavy and cause the sign to be blown over in the high winds of Las Vegas. Commercial real estate signs can be purchased and designed at your local sign shops in Las Vegas. Companies like www.RedRockSignPost.com can install your sign very quickly and at a minimal cost. Take advantage of this type of signage and get your property leased out quickly. June 25, 2016 Robert W.
The Las Vegas sign is a world famous sign that is recognizable by millions of people. It has historic value to the Las Vega community as it is a symbol of Las Vegas. The 25ft Las Vegas sign is located at 5100 Las Vegas Blvd. ( At the south end of the World Famous Las Vegas Strip) It was installed in 1959 by Western Neon Sign Company of Las Vegas. In 2008, a parking lot was added adjoining the sign so that visitors and tourists could take their picture next to the sign in a safe and orderly fashion. It was requested that the Las Vegas Sign become a landmark and in December of 2013, the State Historic Preservation Office for the State of Nevada announced that the “Welcome to Fabulous Las Vegas” sign had been added to the State Register of Historic Places and took its place in history. Las Vegas has many signs and we also have a museum of old signs for people to tour through in the Downtown area of Las Vegas. Las Vegas has been on the cutting edge of sign making for decades. Many wonderful and colorful neon signs have been designed and installed through the years. With sign technology changing, led signs have taken over. The sheer size and colors of all the casino signs is just amazing and tourists love to walk Las Vegas Blvd and simply look at all the interesting and attractive signs. Las Vegas is the sign mecca of the world and is leading the industry for sign making. There are many sign shops located in Las Vegas to assist you in all your graphic and sign needs. Since Las Vegas is the trade show capital of the world, many sign shops are needed to make sure there are plenty of signs and graphics for all the shows. June 24, 2016 Robert W.
Las Vegas economy x stand banners are available at excellent prices in Las Vegas. Many people prefer x stand banners over retractable banner stands because they are cheaper and can be changed out at a later date with another banner. Retractable banner stands are usually ” one and done” and cannot have the insert replaced. X stand banner stands offer an excellent value. There are many different sizes of x stand banners. The 2 most popular sizes are the 24″ x 63″ x stand banner and the 32″ x 71″ x stand banner stand. The larger 32″ x 71″ x stand banner stand sells for under $60.00. Both these x stand banner stands can be produced in a short period of time. That is important, because many people attending the Las Vegas conventions and trade shows lose their graphics or have their graphics damaged while travelling to Las Vegas and need quick replacement of graphics. Sign shops in Las Vegas can be found online through a Google search or through the Yellow Pages. Simply contact a sign shop and inquire about having one of these x stand banners made for your graphic needs. June 22, 2016 Robert W.
Las Vegas 89109 banner printing encompasses the casino convention centers of Las Vegas. Many times people attending the trade shows and conventions of Las Vegas are in need of banner printing after finding out their banners and signs have been damaged while traveling to Las Vegas or lost while going to Vegas. Consequently, these people are in need of Las Vegas 819109 banner printing to assist them with their trade show and convention needs. Las Vegas 89109 banner printing is done by many sign and print shops in the Las Vegas area. There are many sign shops due to the fact that Las Vegas is the top destination for conventions and trade shows in the world. While most people think of Las Vegas as the gambling mecca, there is so much more to do in Las Vegas than just gamble. There is a wide variety of fine dining and world class accommodations in Las Vegas as well as first class entertainment by the best entertainers in the world. In addition, there is nearby Lake Mead and Hoover dam along with Mt Charleston for hiking and camping. Las Vegas 89109 banner printing is not that expensive due to the fact that most sign shops have state of the art large format printers that are capable of producing top quality banners and signs with quick turnaround times and low cost. The average price of full color banners in Las Vegas is around $2.00 a square foot and there are many sign shops ready and willing to assist you with your graphics needs. Whether it be full color banners, retractable banners or printed vinyl, a sign shop is willing to help you replace those lost or damaged graphics. Contact a local sign shop in Las Vegas to assist you with your graphic needs. You will find them to be most reasonably priced. June 21, 2016 Robert W.
Step repeat banners 5ft x 8ft are being used for all sorts of events and parties. Step and repeat banners gained popularity recently because they allow you to take photographs against a banner background that contains a picture or message that you wish to advocate in your photograph. For example, the Globe Awards is a prestigious event that attracts many celebrities. Consequently, the Globe Awards producers want to have the celebrities pictures taken against a backdrop that has the ” Globe Awards” spelled out so that from any angle a picture is taken, the words ” Globe Awards” are visible in the background. Many people want to have their pictures taken against these step and repeat banners like the stars. Many casino nightclubs offer these step and repeat banners with their names on the banner so that guests are allowed to take pictures against these banners so that they can take them home as souvenirs. ( Many casino night clubs refrain from picture taking inside the club for various reasons) By allowing the guests to have their pictures taken against the step and repeat banners, they make the guests happy and also promote their club as well. Step repeat banners 5ft x 8ft are being used at business events where a small amount of people will have their picture taken against the banner ( with the companies name on it) and birthday parties that allow for the banner to have the birthday person’s name and theme on it. Many times people will bunch up and take a group photo against the banner because of its size. Step repeat banners 5ft x 8ft are not that expensive. A 5ft x 8ft step and repeat banner sells for around $80 and a stand can be purchased along with it to make it easy to install and take down ( much like the professionals).